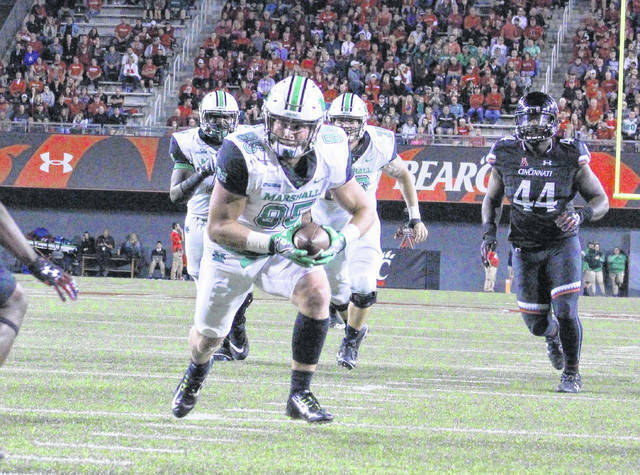 Marshall senior tight end Ryan Yurachek (85) heads toward the end zone for a touchdown during the third quarter of a Sept. 30 non-conference football game against the Cincinnati Bearcats at Nippert Stadium in Cincinnati, Ohio. IRVING, Texas — A total of 13 members from the 2017 Thundering Herd represented Marshall on the All-Conference USA football teams, as selected by the 14 head coaches from the conference. Marshall — which finished the regular season at 7-5 overall — was 4-4 in the conference this fall, placing the Green and White tied with Western Kentucky and Middle Tennessee for third in the East Division. Three members of the Herd landed on first team, five more made the second team, while three were named honorable mention. In addition, MU had two players listed on the all-freshman squad. On the first team offense for the Herd were senior tight end Ryan Yurachek and junior wide receiver Tyre Brady, while senior Kaare Vedvik made the first team special teams as a punter. Yurachek, who was all-conference honorable mention in each of the last two seasons, hauled in 47 passes for 430 yards and nine scores this fall. His nine touchdowns were the most among any tight end in the conference. Brady caught 56 passes for 777 yards and six touchdowns this season, while Vedvik averaged a league-best 44.4 yards per punt and downed a total of 23 punts inside the opponent’s 20-yard line. Marshall’s second team selections included center Levi Brown on the offense, defensive lineman Ryan Bee, linebacker Chase Hancock, and safety Malik Gant on defense, as well as kick returner Keion Davis on special teams. Brown — a sophomore who was on the all-freshman portion of the list last year — started all-12 games for the Green and White, anchoring an offensive line that helped the team rush for 1,584 yards this fall. Bee — a junior that was featured as an honorable mention last season — came up with a team-best 5.5 sacks this season, while earning 59 tackles, including 6.5 for a loss. A junior at MU, Hancock recorded a team-best 120 tackles this season, 32 of which were unassisted and nine came for a loss. Gant, a sophomore, had 96 tackles this fall, including 5.5 for a loss and a team-best 45 unassisted. Davis, a junior, posted 525 yards and two touchdowns on 17 kick returns for the Herd. Marshall’s honorable mention selections were wide receiver Marcel Williams, defensive back Chris Jackson and long snapper Matt Beardall. Both Jackson and Beardall were on the all-freshman list a year ago. Williams caught 41 passes for 512 yards and two touchdowns this season, Jackson recorded 59 tackles and a team-best three interceptions, while Beardall appeared in all-12 games as the long snapper. Marshall’s all-freshman team representatives were running back Tyler King and offensive lineman Tarik Adams. King led the team with 717 yards and six rushing scores in his rookie campaign, while Adams started all-12 games and helped turnout 4,437 yards of total offense this season. Florida Atlantic sophomore running back Devin Singletary was named Most Valuable Player, while North Texas sophomore quarterback Mason Fine and UTSA senior lineman were named Offensive Player of the Year and Defensive Player of the Year respectively. The Special Teams Player of the Year was Old Dominion junior kick returner Isaiah Harper, the Freshman of the Year was UAB running back Spencer Brown, while the Newcomer of the Year award was shared by Teddy Veal from Louisiana Tech and Jalen Guyton from North Texas. The conference Coach of the Year award went to UAB’s Bill Clark, who led the Blazers to a second place finish in the West Division in the team’s first year back on the gridiron. QB – Mason Fine, So., North Texas. RB – Devin Singletary, So., Florida Atlantic; Ito Smith, Sr., Southern Miss. OL – Reggie Bain, R-Jr., Florida Atlantic; Roman Fernandez, R-Sr., Florida Atlantic; Antonyo Woods, Sr., Florida Atlantic; Will Hernandez, Sr., UTEP; Brandon Ray, R-Sr., WKU. TE – Ryan Yurachek, Sr., Marshall. WR – Thomas Owens, Sr., FIU; Tyre Brady, R-Jr., Marshall; Korey Robertson, Jr., Southern Miss. DL – Jaylon Ferguson, Jr., Louisiana Tech; Oshane Ximines, Jr., Old Dominion; Brian Womac, Sr., Rice; Marcus Davenport, Sr., UTSA. LB – Azeez Al-Shaair, Jr., Florida Atlantic; Emmanuel Ellerbee, Sr., Rice; Joel Iyiegbuniwe, Jr., WKU. DB – Jalen Young, Jr., Florida Atlantic; Shelton Lewis, Jr., Florida Atlantic; Secdrick Cooper, Sr., Louisiana Tech; Darious Williams, R-Jr., UAB. K – Parker Shaunfield, Jr., Southern Miss. P – Kaare Vedvik, R-Sr., Marshall. KR – Isaiah Harper, Jr., Old Dominion. PR – Darrell Brown, So., Old Dominion. LS – Cameron Linck, GS, Louisiana Tech. Most Valuable Player: Devin Singletary, Florida Atlantic. Offensive Player of the Year: Mason Fine, North Texas. Defensive Player of the Year: Marcus Davenport, UTSA. Special Teams Player of the Year: Isaiah Harper, Old Dominion. Freshman of the Year: Spencer Brown, UAB. Newcomers of the Year: Teddy Veal, Louisiana Tech; Jalen Guyton, North Texas. Coach of the Year: Bill Clark, UAB. QB – Mike White, Gr-Sr., WKU. RB – Jeffery Wilson, Sr., North Texas; Spencer Brown, Fr., UAB. OL – Jordan Budwig, Sr., FIU; O’Shea Dugas, Jr., Louisiana Tech; Levi Brown, R-So., Marshall; Devin Farrior, Sr., Southern Miss. OL – Chris Schleuger, R-Sr., UAB. TE – Harrison Bryant, So., Florida Atlantic. WR – Teddy Veal, R-Jr., Louisiana Tech; Ty Lee, So., Middle Tennessee; Jalen Guyton, R-So., North Texas. DL – Fermin Silva, Jr., FIU; Ryan Bee, R-Jr., Marshall; Xavier Thigpen, Sr., Southern Miss; Kevin Strong Jr, Jr., UTSA. LB – Anthony Wint, Sr., FIU; Chase Hancock, R-Jr., Marshall; Khalil Brooks, R-So., Middle Tennessee. DB – Brad Muhammad, Sr., FIU; Amik Robertson, Fr., Louisiana Tech; Malik Gant, R-So., Marshall; Curtis Mikell, Sr., Southern Miss. K – Trevor Moore, Sr., North Texas. P – Jack Fox, Jr., Rice. KR – Keion Davis, R-Jr., Marshall. PR – Austin Trammell, Fr., Rice. LS – Matt Bayliss, Sr. UTSA. QB – Alex McGough, Sr., FIU; Jason Driskel, R-Jr., Florida Atlantic; Brent Stockstill, Jr., Middle Tennessee; A.J. Erdely, R-Jr., UAB. RB – Alex Gardner, Sr., FIU; Gregory Howell Jr., Sr., Florida Atlantic; Jarred Craft, Sr., Louisiana Tech; Boston Scott, R-Sr., Louisiana Tech; Ray Lawry, Sr., Old Dominion. OL – Nate Davis, R-Jr., Charlotte; Eugene German, R-Sr., Charlotte; Joshua Outlaw, R-Sr., Louisiana Tech; Ethan Reed, R-So., Louisiana Tech; Robert Behanan, R-Jr., Middle Tennessee; Chandler Brewer, Jr., Middle Tennessee; T.J. Henson, Sr., North Texas; Sosaia Mose, R-So., North Texas; Jordan Murray, Jr., North Texas; Elex Woodworth, R-So., North Texas; Nick Clarke, Jr., Old Dominion; Isaac Weaver, R-Fr., Old Dominion; Calvin Anderson, Jr., Rice; Trey Martin, Sr., Rice; Drake Dorbeck, So., Southern Miss; Arvin Fletcher, Fr., Southern Miss; James Davis, R-Jr., UAB. TE – Pharoah McKever, Sr., FIU; Kam McKnight, R-Jr., Louisiana Tech; Deon Yelder, R-Sr., WKU. WR – Rashid Bonnette, R-So., Louisiana Tech; Marcel Williams, Jr., Marshall; Michael Lawrence, So., North Texas; Austin Walter, Jr., Rice; Allenzae Staggers, Sr., Southern Miss; Andre Wilson, R-Jr., UAB; Nacarius Fant, Sr., WKU; Lucky Jackson, R-So., WKU. DL – Steven Leggett, Jr., Florida Atlantic; Leighton McCarthy, R-Fr., Florida Atlantic; Hunter Snyder, R-Jr., Florida Atlantic; Jeremiah Taleni, GS, Florida Atlantic; Jordan Bradford, Jr., Louisiana Tech; Deldrick, Canty, Sr., Louisiana Tech; Walter Brady, R-Jr., Middle Tennessee; Roderick Young, Jr., North Texas; Miles Fox, Jr., Old Dominion; Bunmi Rotimi, Sr., Old Dominion; Roe Wilkins, So., Rice; Rod Crayton, Sr., Southern Miss; LaDarius Harris, Jr., Southern Miss; Draper Riley, Sr., Southern Miss; Garrett Marino, R-So., UAB; Teko Powell, R-Sr., UAB; Chris Johnson, Sr., WKU. LB – Juwan Foggie, R-Jr., Charlotte; Jeff Gemmell, R-So., Charlotte; Treyvon Williams, Sr., FIU; Russell Farris, Sr., Louisiana Tech; Dae’Von Washington, R-Jr., Louisiana Tech; DJ Sanders, Sr., Middle Tennessee; E.J. Ejiya, Sr., North Texas; Paxton Schrimsher, R-So., Southern Miss; Tevin Crews, R-Sr., UAB; Shaq Jones, R-Sr., UAB; Julian Jackson, Sr., UTEP; Alvin Jones, Sr., UTEP; La’Kel Bass, Sr., UTSA. DB – Ben DeLuca, So., Charlotte; Bryce Canady, Sr., FIU; Andrew Soroh, R-Jr., Florida Atlantic; Chris Tooley, So., Florida Atlantic; Chris Jackson, So., Marshall; Reed Blankenship, Fr., Middle Tennessee; Jovante Moffatt, Jr., Middle Tennessee; Kishawn McClain, Sr., North Texas; Brandon Addison, Sr., Old Dominion; Cornell Armstrong, Sr., Southern Miss; Tarvarius Moore, Sr., Southern Miss; Broderick Thomas, R-Jr., UAB; Kalon Beverly, Jr., UTEP; Devin Cockrell, Sr., UTEP; Nik Needham, Jr., UTEP; Nate Gaines, Sr., UTSA; Joe Brown, Sr., WKU; DeAndre Farris, R-Jr., WKU; Drell Greene, Jr., WKU. K – Jose Borregales, R-Fr., FIU; Greg Joseph, Sr., Florida Atlantic; Jonathan Barnes, Sr., Louisiana Tech; Canon Rooker, Sr., Middle Tennessee; Jared Sackett, Fr., UTSA; Arthur Hart, Sr., Charlotte; Alan Luna, Sr., UTEP; Jake Collins, Jr., WKU; Chris Montgomery, Sr., Charlotte; Kerrith Whyte, So., Florida Atlantic; Kylen Towner, R-Sr., WKU. LS – J.R. Clancy, So., Florida Atlantic; Matt Beardall, So., Marshall; Reed Buce, Sr., Old Dominion; Jake Sammut, Jr., UTEP; Ben Reeder, Fr., WKU. QB – Steven Williams, Old Dominion. RB – Tyler King, Marshall; Spencer Brown, UAB. OL – Tarik Adams, Marshall; Kody Russey, Louisiana Tech; Isaac Weaver, Old Dominion; Arvin Fletcher, Southern Miss; Tyler Witt, WKU. TE – Jordan Myers, Rice. WR – Willie Wright, Florida Atlantic; Aaron Cephus, Rice. DL – Leighton McCarthy, Florida Atlantic; Jordan Ferguson, Middle Tennessee; Jacques Turner, Southern Miss; Trace Mascorro, UTEP; Jaylon Haynes, UTSA; Joe Ozougwu, North Texas. LB – Jordan Young, Old Dominion; Racheem Boothe, Southern Miss. DB – Amik Robertson, Louisiana Tech; Reed Blankenship, Middle Tennessee; Joe Joe Headen, Old Dominion; Devon Key, WKU. K – Jared Sackett, UTSA. P – Zac Everett, Southern Miss. KR – Bryce Singleton, FIU. PR – Austin Trammell, Rice. LS – Ben Reeder, WKU.